Japan suffered much mentally as well as physically from the earthquake in Tohoku four years ago. However, we are moving to reconstruction, thanks to the worldwide support and local people's positive mentality. A word "Kizuna" brought everyone's mind together at that time. How much we are relieved when we are at a loss in facing big challenges but there is someone who gives a helping hand. I believe "kizuna" links a lot with love, including love of parents and love between women and men. 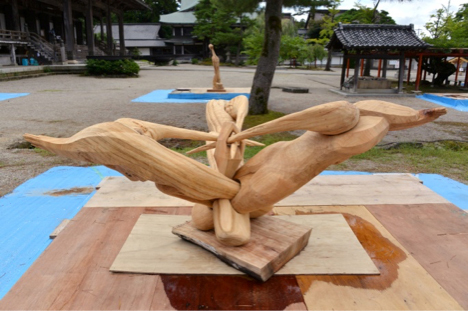 I would like to take this opportunity to express "kizuna" as a wooden sculptor.